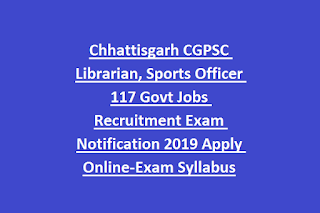 Chhattisgarh PSC Librarian Jobs Recruitment 2019: Chhattisgarh State Public Service Commission CGPSC invites applications from the CG Moolanivasi candidates to recruit the available Librarian sports officers posts of Chhattisgarh State Technical Education Department. 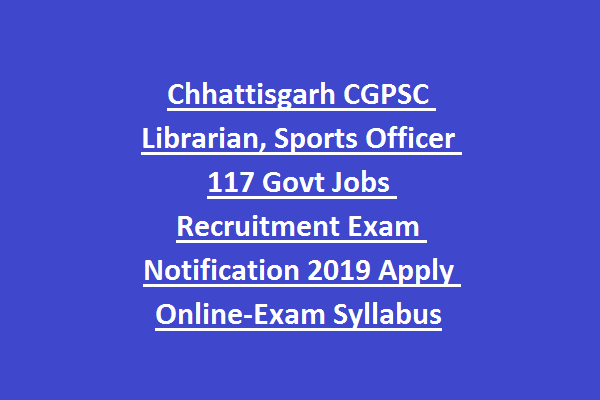 There are total 117 Librarian and Sports officer jobs available in CGPSC Recruitment 2019. Online applications will be received from the qualified candidates in between the dates of 05-04-2019 and 04-05-2019 till 11:59 PM. Recruitment of this CGPSC Librarian and Sports Officer jobs will be conducted through online written exam and interview. Complete information of Librarian, Sports Officer Jobs of Chhattisgarh Public Service Commission CGPSC Recruitment 2019 qualification details, Exam Pattern and Syllabus, eligibility criteria and more details are given below. Download notification of Chhattisgarh CGPSC Sports Officer, Librarian Jobs Recruitment. Online Application starts from: 05-04-2019. Last date to submit applications online: 04-05-2019. CGPSC Written exam date: June 2019. There are total 117 vacancies available in Chhattisgarh CGPSC Sports Officer Jobs Librarian Recruitment. Post Name: Librarian - 56 posts. Candidate must have completed Degree in Library/ Library Science and Information science from a recognized Institution/ University by the UGC. For Sports Officer Candidate must have studied Degree in Physical Education or Degree in Sports with at least 55% or marks or its equivalent and must have participated in University level or State level sports competitions. Should be physically fit . Physical test will be conducted. Upper age limit for Chhattisgarh state bonafied candidates is 40 years. For more details refer official notification. For SC/ST/OBC candidates examination fee is Rs.300/- and for all other candidates examination fee is Rs.400/-. Selection for this Librarian and Sports Officer jobs will be held in two stages. Written test will be conducted for 300 marks. Download Exam Syllabus here in Pdf format for Librarian and Sports Officer Jobs of CGPSC.